An umbilical hernia is a protrusion (outward bulging) of the abdominal lining, abdominal fat or a portion of abdominal organ(s) through the area around the umbilicus (navel or belly button). The umbilicus in dogs and cats is located on their underside just below the ribcage. Before birth, the umbilical blood vessels pass through the umbilical ring (an opening in the abdominal muscles) to provide nourishment to the developing fetus. An umbilical hernia is caused by the incomplete closure of the umbilical ring after birth. The hernia generally appears as a soft swelling beneath the skin and it often protrudes when the puppy is standing, barking, crying, or straining. 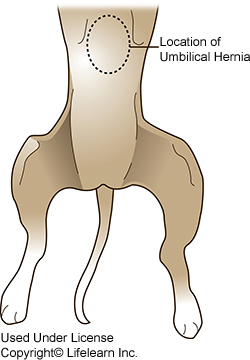 Some hernias are reducible, meaning that the protrusion can be pushed back into the abdomen while others are non-reducible indicating at least partial obstruction or adhesion of the herniated contents to the opening. "Some hernias are reducible, meaning that the protrusion can be pushed back into the abdomen." An umbilical hernia can vary in size from less than a quarter-inch (1-cm) to more than an inch (2.5-cm) in diameter. Small (less than ¼ inch or 1-cm) hernias may close spontaneously (without treatment) by age 3 to 4 months. Umbilical hernias that do not close may require surgery, especially if a portion of an intestinal organ protrudes through it. Umbilical hernias are usually painless. The exact incidence and cause is unknown. Certain family lines have a higher incidence of umbilical hernias suggesting at least a partial genetic predisposition to the condition. Is an umbilical hernia dangerous? Most umbilical hernias pose no health threats. "In rare cases, a portion of the intestines or other tissues can be trapped and become strangulated." In rare cases, a portion of the intestines or other tissues can be trapped and become strangulated(blood flow is cut off to the tissue, causing its death). This is an emergency requiring immediate surgery. If the hernia has not closed by the time of spaying or neutering, surgical repair of the hernia is recommended. The surgery can be performed at the time of spaying and neutering. The fibrous or scar tissues that have formed around the hernia are dissected out or removed, and the defect is closed with sutures. What is the prognosis for an umbilical hernia? The prognosis is excellent following surgical correction. 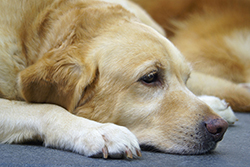 Few puppies experience recurrence of the hernia and few complications are reported with the procedure.